Due to the recent poor weather in Hong Kong, my new APM 1.25” Herschel Wedge has been waited in the storeroom for a few days. Although both transparency and seeing were bad today, the sun was awaken! After I used my LS35T to shot the big prominence, I compared the Thousand Oaks Optical Solar Filter Type 2+ & Herschel Wedge. Luckily, the sun has a very small sunspot. It is not obviously showed in my little LS35T. 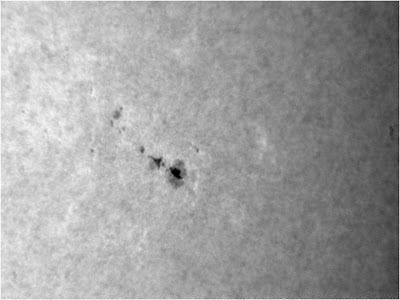 The resolution of LS35T is not high enough to see the detail of the small sunspot. 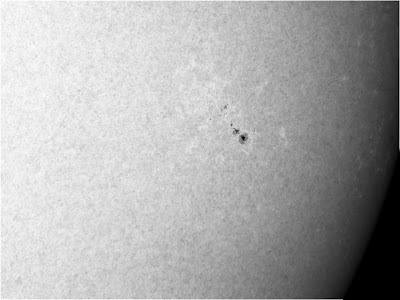 I deliberately used the Oaks Optical Solar Filter Type 2+ & Herschel Wedge on Equinox 120ED respectively. The sun surface showed by Thousand Oaks was quite flat. However, the sun surface showed by Herschel Wedge has details! The color of Herschel wedge is natural and the image is of high contrast compared with Thousand Oaks filter. In terms of safety, I like the Herschel Wedge because if it is taken away, basically one cannot do observation. On the other hands, if a front solar filter is accidentally dropped off, one can still place his or her eyes behind the eyepiece. This is disastrous! In terms of flexibility, the Herschel wedge wins. It just virtually turns any refractors into a solar scope! Well nothing to say & let the photos speak for them.